Darrelle Shavar Revis (born July 14, 1985) is an American football cornerback for the New York Jets of the National Football League (NFL). He played college football for the University of Pittsburgh, and was drafted in the first round (14th overall) by the New York Jets in the 2007 NFL Draft. He has also played for the Tampa Bay Buccaneers and New England Patriots. His spot on the field is nicknamed "Revis Island," a phrase Revis has trademarked, for his ability to shut down the opposing number one receiver. By 2010, he was considered one of the best cornerbacks in the NFL. High school accolades include the Pittsburgh Tribune-Review 2003 Player of the Year, Pittsburgh Post-Gazette 2003 WPIAL Class AA Player of the Year, and 2003 Pittsburgh Post-Gazette “Fabulous 22”. In the PIAA Class AA State Championship football game, he led Aliquippa to a come-from-behind 32–27 win over Northern Lehigh by scoring 5 touchdowns including 3 rushing touchdowns, a punt return, and the return of a blocked Northern Lehigh field goal attempt. He also completed a 39-yard pass, had a reception, and an interception in the game. In his junior and senior years of high school he led Aliquippa to WPIAL basketball championships, leading the team in scoring both years, culminating with a 25.2 PPG average his senior season. He also had the most interceptions out of any cornerback for high school. In track & field, he ran on the Quips' WPIAL Class AA champion 4x100-metres relay team that placed third at the state championships. Revis attended the University of Pittsburgh, and played for the Pittsburgh Panthers football team. He earned first-team freshman All-America honors his 2004 freshman campaign. Revis played all 12 games, and started 11 of those 12. Revis tied for fifth on the team with 49 tackles, tied for team lead with 12 broken-up passes, and second on the team with 14 defended passes. Revis also had two interceptions. The most important of the two interceptions was against the West Virginia Mountaineers, when he intercepted a late pass that set up the Panthers' game-winning drive. Revis also had a career-high seven tackles against the Boston College Eagles. With Pitt leading 17–10, the Boston College Eagles elected to go for it late in the fourth on fourth-and-goal. The pass got to the one-yard line, but Revis hit the receiver and stopped him from getting the score. Revis' sophomore season in 2005 was another excellent campaign. Revis earned first-team All-Big East at cornerback. Revis led the Panthers with four interceptions and was second-team with 13 defended passes. Revis was ranked second in the Big East with two recovered fumbles. Revis had a 79-yard punt return for a score against the Cincinnati Bearcats, and blocked a field goal against Connecticut Huskies which was returned for the score. Revis also had an interception and totaled 119 punt return yards against Rutgers Scarlet Knights. Revis' final year at Pitt, his 2006 junior campaign, was where he established himself on the national stage. He was a candidate for Jim Thorpe Award and Bronko Nagurski Trophy at the end of the season. Revis recorded interceptions against the Virginia Cavaliers and Cincinnati, which were both taken back for touchdowns. During the 2006 Backyard Brawl game with rival West Virginia, Revis made a dynamic, 73-yard punt return, while breaking several tackles, and finally scoring a touchdown late in the second quarter. The key block to spring him, by Pitt wide receiver Derek Kinder, took out two Mountaineers. The play was nominated for "Best Play" at the 2007 ESPY Awards and was voted the best College Football Play of the Year. On January 10, 2007, Revis announced he would forgo his senior year at Pittsburgh to enter the 2007 NFL Draft; he was considered one of the top 3 cornerbacks available—along with Leon Hall of Michigan and Aaron Ross of Texas— and was one of the 30 to be drafted. He received an invitation to the NFL Scouting Combine however, he chose not to attend after suffering a strained hamstring. He did perform for scouts at Pittsburgh's Pro Day, impressing them with his 40-yard dash, a main concern scouts had prior to him completing the test. Teryl Austin, the Arizona Cardinals' defensive backs coach at the time stated, "nobody went away disappointed." Revis was touted by ESPN's Len Pasquarelli as having "terrific coverage techniques". All values are taken from Pittsburgh's Pro Day (March 16, 2007). New York Jets scout Terry Bradway was impressed by Revis' workout but was concerned by the level of competition Pittsburgh played, as Louisville's Mario Urrutia was the toughest receiver Revis faced during the season. Despite this concern, the organization was so impressed by his man and zone coverage techniques and his ability to play the run that they decided to trade up for him in the draft. Originally, New York discussed trading draft selections with the Houston Texans who had the 10th overall pick however, when the deal fell through, they traded their first, second and fifth round picks to the Carolina Panthers, moving from 25th overall to 14th overall, to select Revis. Revis missed the first 21 days of training camp while his agents negotiated a contract. At one point, Revis' mother was flown in from Pittsburgh to help expedite the negotiation process. On August 15, 2007, the Jets came to an agreement with Revis. The 47 page contract was worth approximately $36 million over five years according to ESPN writer John Clayton. Head coach Eric Mangini expected Revis to contribute immediately citing his abilities on defense and special teams. He likened Revis' talents to that of Ty Law, who was once described as a "shutdown" cornerback. After signing his contract, Revis had his first day of practice four days later with veteran Kerry Rhodes providing guidance throughout the session. Revis made his preseason debut against the New York Giants on August 25, 2007 after less than a week of practice. In his debut, he recorded five tackles and one pass defended against receiver Sinorice Moss and had one punt return for 13 yards. Revis was named the starting cornerback for the Jets at the end of the preseason, becoming the first Jets rookie cornerback to start since Ray Mickens in 1996. In his first game against the New England Patriots, Revis recorded 7 tackles and held Wes Welker to 6 catches for 61 yards in the 38–14 loss. He recorded the first interception of his career against the division-rival Buffalo Bills during their week 8 matchup. Revis would show great progression throughout the season, remaining as the Jets' solid starter and one of their best defensive players. Starting at 16 games, Revis ended his rookie season with 87 total tackles, one sack, one forced fumble and 3 interceptions. Revis was only beaten for touchdowns three times during his rookie season by Braylon Edwards, Lee Evans and Terrell Owens. Revis in 2008 wearing a NY Jets throwback uniform. The Jets opened the season with a match-up against the Miami Dolphins. 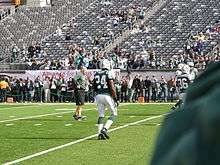 Revis, the established starter, intercepted former Jet Chad Pennington's pass in the end zone with five seconds remaining in the game to preserve the Jets' 20–14 victory. A week later, Revis held Patriots wide receiver Randy Moss to two catches for 22 yards. Mangini praised Revis' attention to detail and perfecting the flaws of his game. Revis was beaten by Chris Chambers for a 27-yard touchdown during the Jets' week three contest against the San Diego Chargers—he recorded two tackles in the loss to San Diego. The following week the Jets faced the Arizona Cardinals with wide receivers Larry Fitzgerald and Anquan Boldin. He intercepted two Kurt Warner passes, one of which he returned 32 yards for a touchdown, the first of his NFL career. Despite his performance alongside All-Pro safety Kerry Rhodes, the Jets' pass defense was ranked 28th which prompted coach Eric Mangini to sign free agent All-Pro cornerback and former New York Jet Ty Law in November. Though the addition of Law was made to bolster the Jets' pass defense, the pass defense continued to struggle and would rank 29th overall by season's end in spite of Revis' positive performance. It should be noted that Revis' side of the field was known not to be tested as teams instead chose to attack rookie cornerback Dwight Lowery. For his efforts, Revis was elected to the 2009 Pro Bowl. During the Pro Bowl, Revis intercepted a pass intended for Anquan Boldin with one hand. Darrelle Revis started off the '09 season matched up against some of football's best wide receivers. In Week 1, he helped limit Houston Texans Pro-bowler Andre Johnson to four receptions for 35 yards. Revis then faced Tom Brady and the New England Patriots, when he matched up against another Pro-bowl receiver, Randy Moss, and limited him to four receptions and 24 yards after catching 14 passes for 141 yards the week prior. Revis also had an interception against Brady, helping the Jets defense to be the first team since 2006 to stop the Patriots from scoring a touchdown. Week 5 against the Miami Dolphins was the lone blemish on Revis' season, as he was beaten by wide receiver Ted Ginn, Jr. for a 53-yard touchdown reception on Monday Night Football, during the Jets 31–27 week 5 loss to the Dolphins. Jets head coach Rex Ryan has stated on several occasions that he thinks Revis is the "best" cornerback in the NFL, and that he is also the best cornerback he's worked with, in all of his years of coaching defenses. NFL Total Access ranked him as the No. 3 cornerback in the league on a Best In The Biz list before the '09 season kicked off. Deion Sanders also said "Revis is going to be the best corner in the game for years." Revis ended the year winning a Pro Bowl spot, and earned major respect inside and outside the league. In Week 17 (the NFL's last regular season week), he ended up locking Cincinnati Bengals receiver Chad Ochocinco down, preventing Ochocinco from a single reception, in part because a win would not advance Cincinnati to a higher playoff seed, and also because Ochocinco left the game with an injured knee. The Jets won the game 37–0, their second shutout, and third 'defensive' shutout. The victory qualified the Jets for the postseason, and the two teams met up again six days later in the first round. During the Jets' 24–14 victory over the Bengals, Revis again shut down Ochocinco, limiting him to two catches for 28 yards and collecting an interception. This, in my opinion, was the best year a corner has ever had, the most impact a corner has ever had in the National Football League. That's my opinion. Apparently, that wasn't how everybody felt. A number that I think would be interesting would be eight, and no, that’s not the amount of touchdown passes that Green Bay (Woodson's team) gave up against Arizona. That is the number of touchdown passes we gave up all season, and the biggest reason for that is Darrelle Revis. In the second week of the playoffs, Revis and the Jets defeated the AFC's #2 seed San Diego Chargers, 17–14. Since the Chargers had a large variety of well acclaimed receivers, Revis was forced to cover most of them, yet San Diego quarterback Philip Rivers only threw the ball to a receiver covered by Revis three times during the entire game. Two of the three were tipped away by Revis for an incomplete pass, and the third was an interception. His interception was made diving to the ground to catch a ball that was deflected off the shoe of Chargers' wide receiver Vincent Jackson. Revis' interception changed the momentum of the game and was instrumental in the Jets' 17–14 victory. The win led the Jets to the AFC Championship game against the Indianapolis Colts, the Jets first trip to the AFC Championship game since 1998. The Jets lost 30–17, due to a lack of scoring in the second half (0 points), and poor secondary playing, with the exception of Revis himself, who only allowed 2 receptions. Revis lost in the Defensive Player of the Year voting to Charles Woodson, 28–14. Revis missed the majority of training camp and all four of the team's preseason contests while holding out for a new contract. He was to receive approximately $1 million in the fourth year of a six-year contract. On September 5, an agreement was reached on a four-year $32 million guaranteed contract, and Revis subsequently reported to camp the next day, a week before the team's season opener. During the team's Week 2 matchup against the New England Patriots, after getting beaten for a deep touchdown by Randy Moss, Revis left the game with what was later revealed to be a strained hamstring. Revis would miss two weeks of the season. Revis reaggravated the hamstring following the team's matchup against the Minnesota Vikings. On October 17, 2010, Revis was activated two hours prior to kickoff against the Denver Broncos and started the game. The Jets headed into a bye week following their victory over Denver thus allowing Revis to rehab his hamstring. Revis has since declared himself to be 100 percent. During the 2011 AFC Wild Card game, Revis held Indianapolis Colts wide receiver Reggie Wayne to one catch for a yard in a victory over the Colts. The Jets went on to defeat the New England Patriots in the divisional round but would lose to the Pittsburgh Steelers in the AFC Championship game. Revis finished the year with 32 tackles but did not record an interception in 13 games. Revis with the Jets in 2011. The Jets' opened their 2011 season against the Dallas Cowboys on September 11, 2011. The game was played at Metlife Stadium on Sunday night football on the ten-year anniversary of the September 11 attacks. The Jets were tied with the Cowboys 24-24 in the final minutes when Revis intercepted a Tony Romo pass intended for Dez Bryant to put the Jets in field goal range. Nick Folk converted the game winning field goal to give the Jets the win 27-24. In Week 6, the Jets were playing the Dolphins with a 2-3 record in what some considered a must win game. Revis intercepted a pass intended for Brandon Marshall and ran it back 100 yards for a touchdown on October 17, 2011, tying the longest interception return in Jets history, first set by Aaron Glenn in 1996. Later in the same game against the Miami Dolphins, he intercepted another Matt Moore pass in the fourth quarter to preserve the Jets' victory with a score of 24-6. On Sunday, October 23, 2011 the Jets were playing the San Diego Chargers. In the fourth quarter, the Jets were down 21-17 and the Chargers had the ball in Jets territory when Darrelle Revis intercepted a pass intended for Vincent Jackson which was deflected right into the hands of Revis. Later on in the drive Mark Sanchez would complete a touchdown pass to Plaxico Burress, his 3rd of the game. The Jets would win 27-21. After 13 games, the Jets were 8-5 going on a 3-game winning streak and looking to make the playoffs for 3 straight years. But the Jets would lose their next 3 games and miss the playoffs by 1 game with a record of 8-8. After the season it came out that the Jets locker room was having problems. Revis ended the year with 52 tackles and 4 interceptions and was elected to his fourth Pro Bowl and third All-Pro team. Revis entered the 2012 season hinting that he may not attend training camp, with the hope of reworking his contract. Despite the uncertainty regarding his contract status, Revis attended training camp. The Jets' season opener was played against the Buffalo Bills on September 9, 2012. Revis intercepted a Ryan Fitzpatrick pass which set up a Mark Sanchez touchdown on the ensuing drive. The Jets would go on to defeat the Bills 48–28. Revis recorded five tackles in addition to the interception but was taken out of the game in the fourth quarter after teammate Bart Scott accidentally hit Revis in the head with his knee while Revis was still on the ground. Revis was diagnosed with a mild concussion and subsequently ruled out for the week two of the season against the Pittsburgh Steelers. He returned the following week against the Miami Dolphins where he recovered a fumble but later left the game with an undisclosed knee injury. An MRI taken the following day revealed Revis suffered a torn anterior cruciate ligament (ACL) and would be out for the remainder of the season. He was placed on injured reserve on October 12, 2012. On April 21, 2013, Revis was traded to the Tampa Bay Buccaneers. Going to Tampa is great. I look at it as a new chapter in my football career. The organization is great. It’s real laid back down there. It’s not a lot of pressure as it is in New York. Revis flew a private jet to travel to Tampa, Florida for an official physical. After being examined by team doctors, including head team orthopedist John Zvijac and director of sports medicine Todd Toriscelli, Revis was deemed healthy. The Jets gave Revis permission to visit the Buccaneers on Sunday morning after reaching an agreement with Tampa Bay on the transaction. Revis was successful in getting one of the biggest contracts in the NFL, in line with other elite players such as defensive end Mario Williams (six years, $96 million), wide receivers Calvin Johnson (eight years, $132 million) and Larry Fitzgerald (eight years, $113 million) received. Revis' 6-year deal was worth $96 million, making him the highest paid defensive back in NFL history, however there was no guaranteed money included. The Jets received the Buccaneers' 2013 first round pick (13th overall) and a 2014 fourth round conditional pick, which could become a third round pick. Revis made his debut with the Bucs on September 8, 2013, playing against his former team, the New York Jets. He had his first interception as a Buccaneer on September 29, against the Arizona Cardinals. On December 27, Revis was selected to his 5th Pro Bowl, his first with Tampa Bay. After the season he was named SN Comeback Player Of The Year. During his first and only season with Tampa Bay, Revis started all 16 games with a sack, 2 interceptions, 11 passes defended, 2 forced fumbles, a fumble recovery, and 50 tackles. Despite Revis' outstanding season, he was not an ideal fit for Tampa Bay's defensive system. When Lovie Smith was hired to replace Greg Schiano, he brought his Tampa 2 defense with him, a zone defense that is focused on an elite middle linebacker, not a shutdown corner. Revis, being an elite man-to-man cornerback, was rumored to be on the trading block because of his large $16 million salary for the 2014 season. On March 12, 2014, the Bucs released Revis after several failed attempts to trade him, making him an unrestricted free agent for the first time of his career. On March 12, 2014, within hours of being released by the Buccaneers, Revis signed a 1-year contract worth $12 million with the New England Patriots, with the salary cap hit spread over two years. In Revis' first and only season in New England, he had 47 tackles, 2 interceptions, 14 passes defensed, and 1 forced fumble. The Patriots finished the season 12-4. In the Divisional game against the Baltimore Ravens, Revis had 2 pass interference calls against wide receiver Steve Smith Sr.. The Patriots would go on to win the game 35-31 and advance to the AFC Championship game. In the AFC Championship game, Revis recorded an interception on Andrew Luck and the Patriots went on to defeat the Indianapolis Colts 45-7. This marked Revis' first trip to the Super Bowl. The Patriots faced the Seattle Seahawks in Super Bowl XLIX on February 1, 2015, and won 28-24. Revis tallied a sack in the game. During the AFC Championship Game and Super Bowl combined, Revis allowed one completion on passes thrown to receivers he was covering. After the season, the Patriots did not pick up a $20 million option in his contract to bring Revis back for a second year following the 2014 season. The New York Jets signed Revis to a five-year, $70 million contract with $39 million guaranteed on March 10, 2015. The Jets were, however, the subject of investigation into tampering after charges were filed by the Patriots. Jets owner Woody Johnson made comments about Revis, who was still under contract with New England at the time. Johnson was fined $100,000 however, the Jets' counter-investigation into Patriots owner Robert Kraft's comments about Revis upon re-signing with New York was dismissed by the league. Revis sustained a concussion against the Houston Texans on November 22, 2015. Revis was born to former high school track star Diana Gilbert and Darryl Revis. He has two siblings, DéAudra, and Terry. Revis is the nephew of former NFL defensive lineman Sean Gilbert. Revis has a daughter, Deyani, and a son, Jayden. On December 2012, Darrelle released his own shoe, the Nike Zoom Revis, which is available in various colors. ↑ Cimini, Rich (March 4, 2011). "Bart Scott trademarked 'Can't wait!'". ESPN. Archived from the original on March 4, 2011. Retrieved March 4, 2011. ↑ Jets PR Department (December 17, 2009). "Rex's Thursday News Conference". New York Jets. Archived from the original on October 13, 2010. Retrieved October 13, 2010. ↑ Legwold, Jeff (October 13, 2010). "Bailey, Revis share island's corner room". The Denver Post. Archived from the original on October 13, 2010. Retrieved October 13, 2010. ↑ Jole, Charles. "Darrelle Revis is Best Cornerback in the NFL by a Wide Margin: Fan Reaction". Yahoo! Sports. Retrieved February 11, 2012. ↑ Ravitz, Nate (January 21, 2010). "Beware of Revis Island". ESPN. Archived from the original on January 6, 2012. Retrieved January 11, 2010. ↑ Graves, Gary (June 9, 2011). "NFL's best series: The top 10 cornerbacks of 2011". USA Today. Archived from the original on January 6, 2012. Retrieved January 6, 2012. ↑ White, Mike (December 8, 2003). "PIAA Class AA: Do-it-all Revis powers Aliquippa to 32–27 win vs. Northern Lehigh". Post-gazette.com. Retrieved September 6, 2010. ↑ "Revis Punt Return TD is ESPN's College Football Play of the Year". Pittsburghpanthers.com. December 14, 2006. Retrieved September 6, 2010. ↑ "Darrelle Revis to Declare for NFL Draft". Pittsburgh Panthers. January 10, 2007. Archived from the original on December 12, 2012. Retrieved December 12, 2012. ↑ "2007 NFL Draft Scout CB Rankings". NFL Draft Scout. Archived from the original on October 8, 2010. Retrieved December 28, 2009. ↑ "2007 NFL Draft – Breakdown by Position – CB". Sports Illustrated. April 2007. Archived from the original on October 8, 2010. Retrieved October 8, 2010. 1 2 3 Finder, Chuck (March 17, 2007). "Pitt Football: Revis' 40 times impress pro scouts". Pittsburgh Post-Gazette. Archived from the original on October 8, 2010. Retrieved October 8, 2010. ↑ Pasquarelli, Len (January 10, 2007). "Pittsburgh's standout cornerback to enter NFL draft". ESPN. Archived from the original on December 12, 2012. Retrieved December 12, 2012. ↑ "Darrelle Revis Draft Profile". NFL Draft Scout. Archived from the original on October 8, 2010. Retrieved December 28, 2009. 1 2 3 Mehta, Manish (January 8, 2010). "Cincinnati Bengals might have drafted cornerback Darrelle Revis if they'd had the chance". The Star-Ledger. Archived from the original on December 12, 2012. Retrieved December 12, 2012. ↑ "Darrelle Revis Selected in the NFL Draft's First Round by the New York Jets". Pittsburgh Panthers. April 28, 2007. Archived from the original on October 8, 2010. Retrieved October 8, 2010. ↑ Crouse, Karen (April 29, 2007). "Jets Trade Up to Draft Revis With 14th Pick". New York Times. Retrieved October 8, 2010. ↑ "Pitt's Darrelle Revis Signs With New York Jets". CBS: Pittsburgh. August 15, 2007. Archived from the original on October 8, 2010. Retrieved October 8, 2010. 1 2 Pasquarelli, Len (August 15, 2007). "Jets reach agreement with first-round draft pick Revis". ESPN. Archived from the original on December 12, 2012. Retrieved December 12, 2012. ↑ Smith, Michael David (August 3, 2007). "Jets Have Big Plans for Revis, Just No Contract". The New York Sun. Archived from the original on December 4, 2008. Retrieved January 6, 2012. ↑ Associated Press (August 19, 2007). "Revis practices with Jets for first time since ending holdout". ESPN. Archived from the original on December 12, 2012. Retrieved December 12, 2012. ↑ Associated Press (August 26, 2007). "Rookie cornerback Darrelle Revis has solid debut in starting lineup for Jets". ESPN. Archived from the original on January 6, 2012. Retrieved January 6, 2012. ↑ "Darrelle Revis". New York Jets. Archived from the original on January 6, 2012. Retrieved January 6, 2012. ↑ Associated Press (December 9, 2007). "Jurevicius recovers 2 late onside kicks to stop rallying Jets". ESPN. Archived from the original on October 9, 2010. Retrieved October 9, 2010. ↑ Ackert, Kristie (October 29, 2007). "Darrelle Revis gets burned in Jets loss". New York Daily News. Archived from the original on October 9, 2010. Retrieved October 9, 2010. ↑ Cimini, Rich (November 22, 2007). "Darrelle Revis keeps Terrell Owens cornered until end". New York Daily News. Archived from the original on October 9, 2010. Retrieved October 9, 2010. ↑ Associated Press (September 7, 2008). "Favre throws for two TDs in Jets' victory". ESPN. Archived from the original on December 12, 2012. Retrieved December 12, 2012. 1 2 Stephenson, Colin (September 19, 2008). "New York Jets' Revis is turning into a star". The Star-Ledger. Archived from the original on December 12, 2012. Retrieved December 12, 2012. ↑ Hutchinson, Dave (October 29, 2008). "New York Jets' Revis gaining respect of peers". The Star-Ledger. Archived from the original on December 12, 2012. Retrieved December 12, 2012. ↑ Associated Press (September 28, 2008). "Favre's career day carries Jets past Cardinals". ESPN. Archived from the original on December 12, 2012. Retrieved December 12, 2012. ↑ "NFL Game Center: New York Jets at Miami Dolphins – 2009 Week 5". Nfl.com. Retrieved September 6, 2010. ↑ Cimini, Rich. "Rex Ryan looks toward 2011 season". ESPN.com. ESPN. Retrieved September 15, 2012. ↑ Costello, Brian (September 12, 2011). "Jets rally to beat Cowboys in 4th-quarter thriller". New York Post. ↑ McManus, Jane (October 18, 2011). "Revis' star shines brightest in Jets' win". ESPN. Archived from the original on November 9, 2011. Retrieved November 9, 2011. ↑ "Rex Ryan jokes about San Diego". ESPN. Retrieved September 14, 2012. ↑ Shpigel, Ben (January 1, 2012). "Jets' Chances End Early as Offense Fights Itself". nytimes.com. nytimes. Retrieved September 15, 2012. ↑ "Source: No holdout for Darrelle Revis". ESPN New York. July 21, 2012. Archived from the original on September 14, 2012. Retrieved September 14, 2012. ↑ Mehta, Manish (September 9, 2012). "NY Jets crush Buffalo Bills in opener, 48-28, Mark Sanchez throws three touchdowns, including two to rookie Stephen Hill in rout". New York Daily News. Archived from the original on September 14, 2012. Retrieved September 14, 2012. ↑ Clayton, John (September 14, 2012). "Darrelle Revis sidelined for Week 2". ESPN New York. Archived from the original on September 14, 2012. Retrieved September 14, 2012. ↑ Vorkunov, Mike (September 14, 2012). "Jets defeat Miami Dolphins 23-20 as Nick Folk hits game-winning FG in OT". The Star-Ledger. Archived from the original on September 23, 2012. Retrieved September 23, 2012. ↑ Orr, Conor (September 24, 2012). "Darrelle Revis has torn ACL in left knee, likely ending season for Jets cornerback". The Star-Ledger. Archived from the original on September 24, 2012. Retrieved September 24, 2012. ↑ McManus, Jane (October 12, 2012). "Darrelle Revis placed on IR". ESPN New York. Archived from the original on October 14, 2012. Retrieved October 14, 2012. 1 2 3 Schefter, Adam; Rich Cimini (April 21, 2013). "Jets trade Darrelle Revis to Bucs". ESPN New York. Archived from the original on April 22, 2013. Retrieved April 22, 2013. ↑ "Darrelle Revis happy to escape the NY Jets circus, enjoying 'laid back' Buccaneers". Daily News. New York. ↑ "Inside how the Revis trade to Tampa Bay finally went down". CNN. April 22, 2013. ↑ Rosenthal, Gregg. "Darrelle Revis released by Tampa Bay Buccaneers". Retrieved March 12, 2014. ↑ Martin, Kimberley (March 10, 2015). "Darrelle Revis to return to Jets, who also add cornerback Buster Skrine". Newsday. Archived from the original on March 11, 2015. Retrieved March 10, 2015. ↑ Lange, Randy (March 11, 2015). "'Coming Home': Darrelle Revis, Jets Reunite". NewYorkJets.com. Retrieved March 12, 2015. ↑ Patra, Kevin (2015-01-18). "Pats file tampering charges over Jets' Revis comment". NFL.com. Retrieved 2015-03-13. ↑ Hannable, Ryan (2015-03-13). "Report: NFL investigating Jets for tampering with Darrelle Revis". ESPN.com. Retrieved 2015-03-13. ↑ Cimini, Rich (December 11, 2015). "Darelle Revis returns to practice, says he's ready to play Sunday". ESPN. Retrieved December 11, 2015. ↑ "Darrelle Revis NFL stats". Pro-Football-Reference.com. 1 2 "New York Jets Defense Career Register". pro-football-reference.com. Retrieved August 18, 2012. ↑ "Gilbert, the brother of Revis’ mother, once sat out an entire season in a contract dispute with the Redskins." Wikimedia Commons has media related to Darrelle Revis.